This week has been a very different week for me! I’ve been doing lots of projects, mostly for myself and gifts. But … I’ve also been trying to get prepared to attend some local craft shows that I have coming up this summer. Something that everyone likes, is a polymer clay necklace. So I’ve not only been making these as gifts, but also for myself and for my upcoming shows. This being said, one of the things that I’ve been gathering feedback on is my branding. Everyone loves their little bags that Parker & Lolly come in. But one thing they don’t like? The adoption certificates. While the original idea behind the adoption certificates with StoryBook Scenes and Parker was to identify them as “originals,” my collectors are stating that it’s way to much paperwork. So … I’ve been debating on something different to signify it as a KatersAcres Original … and that is the new faux wax seals. So this week I’ve have been busily creating literally hundreds of these faux wax seals to add to our product bags & merchandise. My brother-in-law & my sister-in-law visited my studio over the weekend. Bird necklaces have been one of the things I’m making this week. These are delicate little bird silhouette’s, similar to the Blob Birds featured here. One of my newer items features with mica shift effects in these faux Egyptian cartouche necklaces, a tutorial for these is coming soon. My newest Lolly also uses the Bird Tutorial for Lolly’s newest friend Mrs. Bird. And my week-long obsession has been these new faux wax seals! A tutorial for how to make your own from any stamp you already have is coming soon! This week has been a crazy busy week here in my neck of the woods! My big focus for this first part of the week has been our community Vacation Bible School! How much fun to see all the smiles & joy on the kids faces when they learn about Jesus Christ. WOW! Every year I teach Bible story and I truly do enjoy it. 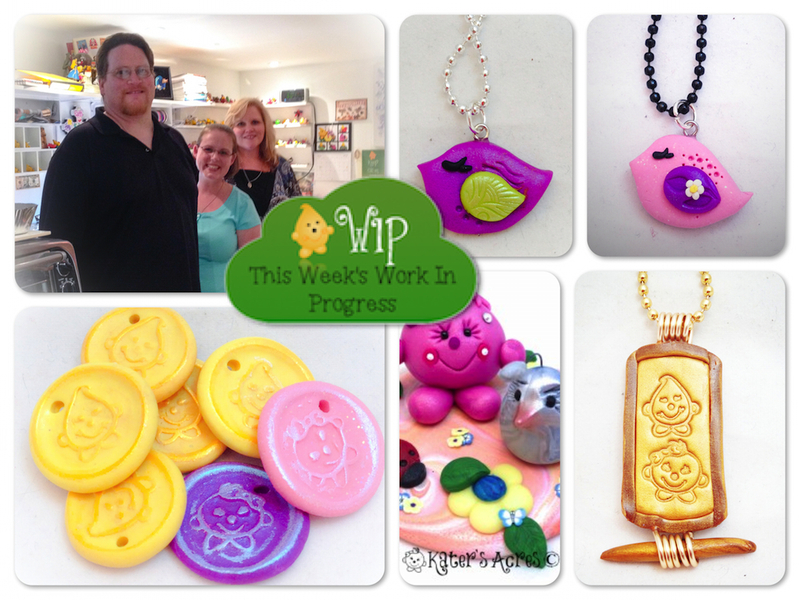 On this week’s agenda are some fun new tutorials that will be coming your way in July. Plus, look for a special announcement coming this week.